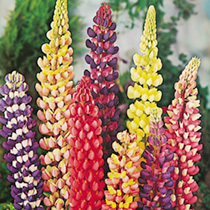 Tall spires of tightly packed flowers rise above clumps of palmate foliage in a magical array of colours. This wonderful mix of the ever popular 'Russell Hybrids' is ideal for adding height and structure to the back of perennial borders and woodland edges. A distinctive hardy perennial that remains a cottage garden favourite. Flowers mid April-mid July. Height 80-90cm (32-36"). 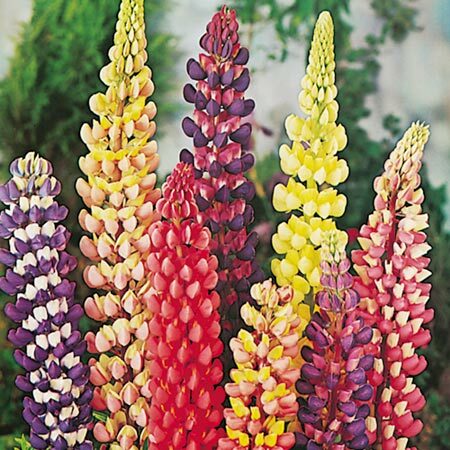 Tall spires of tightly packed flowers rise above clumps of palmate foliage in a magical array of colours. This wonderful mix of the ever popular 'Russell Hybrids' is ideal for adding height and structure to the back of perennial borders and woodland edges. A distinctive hardy perennial that remains a cottage garden favourite.